If you are interested in our program please come to any of our recruitment events! The University of Arizona Mock Trial team, competing nationally since 2002, is an institution focused on improving speaking and critical thinking skills through a simulated court environment. As a program familiar with national-caliber competition, we pride ourselves on a refined understanding of the Rules of Evidence and our ability to argue a clear, coherent case. Students of all majors and interests are encouraged to participate. No prior experience is necessary! Just bring a positive attitude and a desire to learn. You will enjoy every minute of Mock Trial! Mock Trial is a combination of speech, debate, and acting. Students take on the roles of witnesses and attorneys to simulate a trial. Each year the American Mock Trial Association prepares a legal case with witness statements, case law, statutes, and other exhibits. 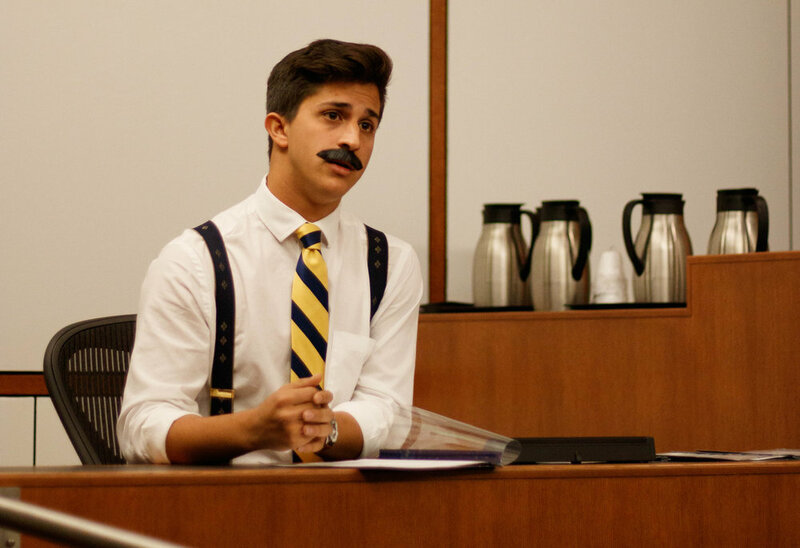 In the first few months of the academic year, teams throughout the United States analyze the case and create arguments for both the plaintiff/prosecution and the defense. Every team has three attorneys and three witnesses and each student is assigned a role: witness, attorney, or both. Teams then compete throughout the remainder of the year by arguing their cases in courtroom settings. Competitions send our teams all across the country in places such as New York, Seattle, Las Vegas, Chicago, Washington D.C., Orlando, and Los Angeles. So, if you are looking to travel the country and have fun in the process, Mock Trial is the club for you! For the University of Arizona Mock Trial program, our favorite time of the year is recruitment! It is that time of the year where we get to welcome many new faces into our program. We encourage anybody who is interested in Mock Trial, improving speaking skills, or simply meeting people who might become some of your best friends, to give our club a shot! Top Ten in the Country. This year marks our 3rd annual Gunslinger Invitational. Competing in this tournament gives competitors the chance to face a diverse field, as well as a variety of other benefits. Click the link below to learn more. Our program had a record breaking year during the 2017-2018 season. With the most competitors the program has had to the team that placed top ten in the country at nationals, this program is only getting better each year. Click the link below to learn more about the competitors from the past. Our program is comprised of a fantastic group of competitors who are diverse and driven towards success. Click the link below to meet the members of this club. The success of our program is due to the dedicated members, fantastic coaches, and every single person who has helped us along the way. Click the link below to learn more about those who have supported us. Captains for round four will be at 1:30pm and the round will start at 2:00pm. All loss for round three is 12:15pm!